Over the past two decades, China has been very successful implementing its long-term strategic foreign policy in Africa, while Russia is still struggling to engage the continent. Russia's problems with Africa are the result of a lack of political will and a concrete policy agenda towards the region. Speaking to the Voice of Russia, Ekho Moskvy and Russian Radio on Oct. 21, Russian Foreign Minister Sergei Lavrov, speaking about Russia’s foreign policy, said: "The main thing is to develop mutual economic ties, something that is yet to be implemented as far as our relations with African nations are concerned. Our trade turnover with African countries currently stands at $4 billion dollars, while China's trade turnover with these countries amount to $120 billion dollars." Alexei Vasiliev, a former special representative of the president of the Russian Federation for relations with African countries, wrote in a recent article to the Valdai Discussion Club that unlike Russia, China has taken a multi-faceted approach to Africa: It includes the provision of grants and loans; rail and highway construction; construction of power plants, housing construction, shopping malls, schools, and hospitals; arms supplies; tens of thousands of Africans studying in China; regular summits and mutual visits at the highest government level. Obviously, both Russian and African policy experts have acknowledged that Russia's investment, so far, is a drop of water in the African ocean. Experts have further explained that during the Soviet era, there were more than 350 Soviet enterprises and well-functioning Soviet cultural centers in Africa, but these were shut soon after the Soviet collapse in 1991. China then took the opportunity to fill the void left by the Soviet exit. In a survey conducted by Buziness Africa between June 2010 and June 2011 nearly 80 percent of the respondents said that Russia's policy problems in Africa were due to the absence of a concrete African agenda, and 65 percent of the respondents indicated that Russian authorities lacked an interest in prioritizing Africa. Ten years ago, Vladimir Shubin, deputy director of the Institute for African Studies said that part of the reason Russia did not engage Africa more was due to “a lack of deep knowledge of African conditions, especially at the initial stage of involvement, which sometimes resulted in suggesting (or agreeing to) unrealistic projects on the continent." It seems that little has changed. And actually, the situation may have gotten worse. There are 36 embassies of African countries in Moscow and some of these diplomats have not done a good job promoting their countries as investment destinations. Many potential African exporters still harbor negative perceptions about Russia and its market, often comparing it to export opportunities offered by the United States, Europe and now new attractive conditions by China. Experts say Russia's market is still not open and the business culture in Russia is not completely understood by African exporters. "The trading links between Africa and the US are well-established and American Growth and Opportunities Act (AGOA) has been able to build on those through offering preferences for some products. There are additional challenges with regards to Russia, such as the language and an unfamiliarity with the culture. And, I think it is not so much that Russia is perceived as not open for business but traders are unsure of how to get into the Russian market,” said Catherine Grant, program head for economic diplomacy at the South African Institute for International Affairs (SAIIA). Grant suggested, however, that to increase trade, Russia could consider offering preferential market access to products from African countries. This has already been done by China and other trading partners. It would be mutually beneficial if the preferences were given on products that Russia does not produce itself. Reduced tariffs would bring down the costs of African goods for Russian consumers. There are various ways to open the market for Africa. One sure way is to use the existing rules and regulations. For example, preferential treatment for agricultural products currently exist, but Africans don't use them. Then, Russian authorities should make it possible for individual African countries to negotiate with the Russian government for their products to enter the market. Later, African regional economic blocs can be useful, because these important blocs can work with their counterparts to facilitate trade between Africa and Russia. The Kremlin needs to study China's aggressive expansion of its economic and geopolitical influence in Africa. This valuable lesson is needed for the right positioning of Russia and the effective protection of its strategic national interests –not only on the African continent, but also in other regions of the world. 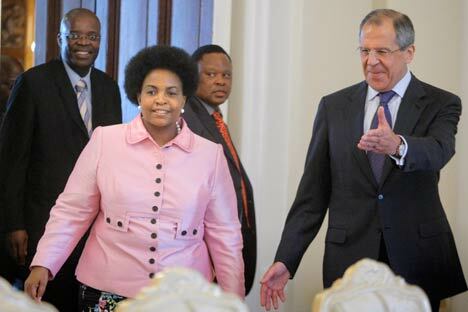 There also seems to be the need for a more vigorous and in-depth dialogue at an enlarged Russia-African Economic Partnership Forum to draw up a long-term and comprehensive Russian policy agenda for Africa.